Payments banks is a new model of banks conceptualised by the Reserve Bank of India (RBI). These banks can accept a restricted deposit, which is currently limited to ₹100,000 per customer and may be increased further. Payments banks can issue services like ATM cards, debit cards, net-banking and mobile-banking. Bharti Airtel set up India’s first live payments bank. Payment Banks are to be registered as public limited companies under the Companies Act, 2013 and are to be licensed under Sec 22 of the Banking Regulation Act, 1949. Payment Banks are to be given the status of scheduled banks under the section 42 (6) (a) of the Reserve Bank of India Act, 1934. However, the words “Payments Bank” have to be used by the companies in their name in order to differentiate it from other banks. They will be governed by the provisions of the Banking Regulation Act, 1949; Reserve Bank of India Act, 1934; Foreign Exchange Management Act, 1999; Payment and Settlement Systems Act, 2007; Deposit Insurance and Credit Guarantee Corporation Act, 1961; and other relevant Statutes and directives. The guidelines will be reviewed by the RBI regularly. RBI’s main aim to push for payments bank is to serve the need of different banking activities in the rural areas. This has both micro and macroeconomic benefits and serves the general public at large. RBI on 23rd September 2013 constituted a committee on Comprehensive Financial Services for Small businesses and Low-Income Households that was headed by Nachiket Mor. The committee submitted its report on 7th January 2014 and also recommended the formation of a new category (Payment Banks) among its other recommendations. Draft guidelines for the license of Payment Banks and their list were released by RBI in February 2015. The license applications were evaluated by External Advisory Committee headed by Nachiket Mor who submitted its report on 6th July 2015 after examining the financial track record as well as governance issue on applicant entities. On 19th August 2015, RBI gave the in-principle license to 11 entities to launch Payment Banks. The In-Principle License is valid for a period of 18 months and the concerned entities are required to fulfil entities are required to fulfil all the requirements within this period. They are not allowed to engage in Banking activities in this period. After the fulfilment of all the conditions which are required to set up a Payment Bank, RBI will grant licenses under S. 22 of the BR Act, 1949. SBs can accept deposits and can offer loan products. PBs can open small saving accounts and accept deposits of upto Rs. 1 lakh per individual. SBs can provide debit card facilities. PBs can issue debit cards but they are not allowed to provide credit card facilities. SBs are allowed to set up their own ATMs. PBs are allowed to set up their own ATMs. SBs can lend money. PBs cannot lend any money to the general public. SBs can accept all types of deposits – fixed deposits, term deposits, recurring deposits etc. PBs cannot accept fixed deposits, term deposits, recurring deposits etc. The main objective of SBs is to provide banking services to small farmers, micro and small industries, and the unorganized sector. The main objective of a PB is to provide banking services to the migrant labour workforce, low-income households, small businesses and other unorganised sectors. Acceptance of demand deposits: A maximum balance of Rs. 1L per customer is allowed. Issuance of ATM/debit cards. Cannot issue credit cards. PBs can act as Business Correspondents (“BCs”) of another bank, subject to the Reserve Bank guidelines on BCs. Internet Banking: RBI is open to PBs offering Internet Banking services, they are required to comply with RBI instructions on internet banking and all the other related guidelines. PBs can undertake utility bill payments etc. on behalf of its customers and the general public. The payments bank will have a leverage ratio of not less than 3% which basically mean that its outside liabilities should not exceed 33.33 times its net worth (paid-up capital and reserves). Bharti Airtel launched India’s first live payments bank named Airtel payment bank in March 2017. Paytm payment bank, India Post payment bank ,Fino Payment bank and Aditya Birla Payment Bank have also launched services. Cholamandalam Distribution Services, Sun Pharmaceuticals and Tech Mahindra have surrendered their licenses. Q2. What is the maximum amount of balance can be maintained an individual in payments bank? Q3. Which committee mooted the idea of payments banks? Q4. 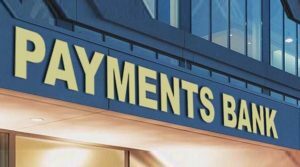 What is the minimum capital required to set up payments bank? Q5. For first five years how much paid-up equity capital needs to be maintained by promoters in payments bank? This entry was posted in BANK EXAMS, canotes. Bookmark the permalink.